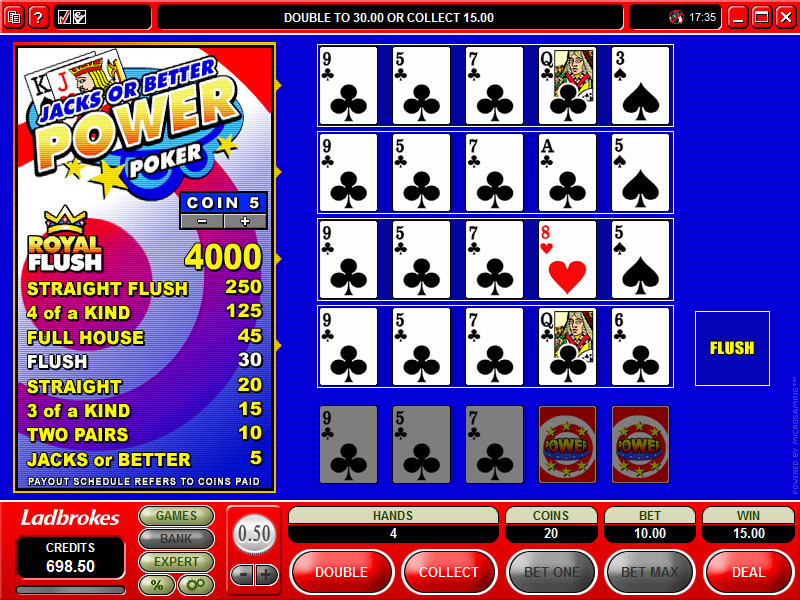 Jacks or Better is the most common video poker game. The name “Jacks or Better” means that the lowest winning hand is a pair of Jacks. With optimal strategy standard 9/6 Jacks or Better returns 99.54% (0.46% house edge). Other common 9/6 Jacks or better is the version offered by Net Entertainment casinos. This version pays 5x bet for straights, 20x for 4-of-a-kind and 40x for straight flushes. With optimal strategy the NetEnt Jacks or Better pays 99.56%. While Jacks or Better has a low house edge, it also has a quite high variance which means that there is a good chance of losing while completing the bonus play-through. However if you get a high paying hand like Royal Flush, you will end up much over the expected value. If you prefer to complete the bonus play-through with low risk of losing, blackjack is a better option if it can be played. The standard deviation per hand in Jacks or Better (single hand version) is 4.42. The following graph shows the probability distribution of the end result when wagering 50xB on Jacks or Better with 1.25€ bet size (bolded in the above table). The percentages in the graph show the cumulative probabilities for the end result. The graph shows that the end result distribution has two humps – those sessions where the player didn’t get a Royal Flush and those sessions where he did.